Last year, two men showed up in Benson, Ariz., a small desert town 60 miles from the Mexico border, offering a deal. Glenn Nichols, the Benson city manager, remembers the pitch. What he was selling was a prison for women and children who were illegal immigrants. But Nichols wasn’t buying. He asked them how would they possibly keep a prison full for years — decades even — with illegal immigrants? “They talked like they didn’t have any doubt they could fill it,” Nichols said. That’s because prison companies like this one had a plan — a new business model to lock up illegal immigrants. And the plan became Arizona’s immigration law. The law is being challenged in the courts. But if it’s upheld, it requires police to lock up anyone they stop who cannot show proof they entered the country legally. When it was passed in April, it ignited a fire storm. Protesters chanted about racial profiling. Businesses threatened to boycott the state. Supporters were equally passionate, calling it a bold positive step to curb illegal immigration. But while the debate raged, few people were aware of how the law came about. NPR spent the past several months analyzing hundreds of pages of campaign finance reports, lobbying documents and corporate records. What they show is a quiet, behind-the-scenes effort to help draft and pass Arizona Senate Bill 1070 by an industry that stands to benefit from it: the private prison industry. The law could send hundreds of thousands of illegal immigrants to prison in a way never done before. And it could mean hundreds of millions of dollars in profits to private prison companies responsible for housing them. Four months later, that model legislation became, almost word for word, Arizona’s immigration law. “ALEC is the conservative, free-market orientated, limited-government group,” said Michael Hough, who was staff director of the meeting. Hough works for ALEC, but he’s also running for state delegate in Maryland, and if elected says he plans to support a similar bill to Arizona’s law. Nothing about this is illegal. Pearce’s immigration plan became a prospective bill and Pearce took it home to Arizona. Pearce said he is not concerned that it could appear private prison companies have an opportunity to lobby for legislation at the ALEC meetings. Pearce may go there to meet with other legislators, but 200 private companies pay tens of thousands of dollars to meet with legislators like him. 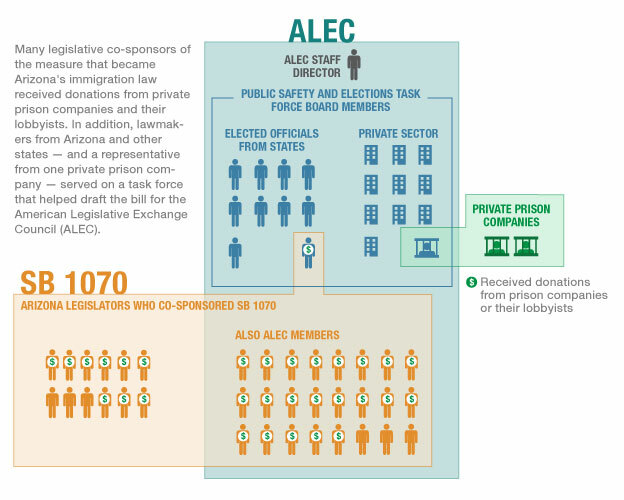 As soon as Pearce’s bill hit the Arizona statehouse floor in January, there were signs of ALEC’s influence. Thirty-six co-sponsors jumped on, a number almost unheard of in the capitol. According to records obtained by NPR, two-thirds of them either went to that December meeting or are ALEC members. That same week, the Corrections Corporation of America hired a powerful new lobbyist to work the capitol. At the state Capitol, campaign donations started to appear. Thirty of the 36 co-sponsors received donations over the next six months, from prison lobbyists or prison companies — Corrections Corporation of America, Management and Training Corporation and The Geo Group. By April, the bill was on Gov. Jan Brewer’s desk. Brewer has her own connections to private prison companies. State lobbying records show two of her top advisers — her spokesman Paul Senseman and her campaign manager Chuck Coughlin — are former lobbyists for private prison companies. Brewer signed the bill — with the name of the legislation Pearce, the Corrections Corporation of America and the others in the Hyatt conference room came up with — in four days. Brewer and her spokesman did not respond to requests for comment. After company officials laughed, the company’s president, Wayne Calabrese, cut in. Opportunities that prison companies helped create. Produced by NPR’s Anne Hawke.